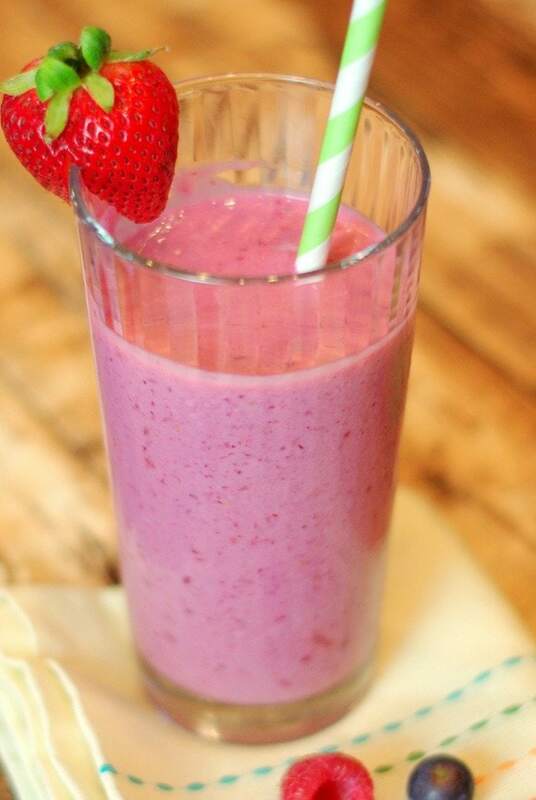 This basic berry smoothie is a great way to start the morning. 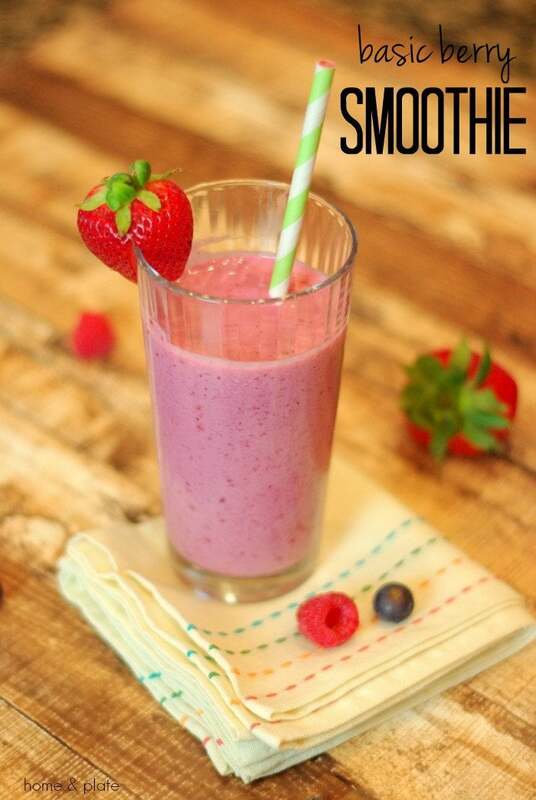 Chock full of strawberries and blueberries this yogurt smoothie is also high in protein. 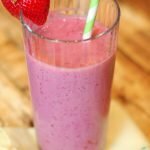 My teenager loves a basic berry smoothie. He is just not a big fan of bananas. So I’ve had to get creative in how I mix up his smoothies while leaving out the bananas. Making sure his berry smoothie has plenty of protein is my main goal. And for that I use Greek yogurt. If I’m using fresh berries I freeze the yogurt. If I’m using frozen berries I don’t. I like the consistency of a frozen, slushy smoothie. Freezing Greek yogurt will not change the beneficial cultures of the yogurt. I don’t thaw the yogurt completely, just until slushy. Perfect for a smoothie. I keep it simple. I use Yoplait strawberry or mixed berry Greek yogurt in the smoothies. If I freeze the yogurt, I let each container sit in a pan of hot water for about 5-10 minutes before chunking it up with a fork. An immersion blender is perfect for blending a healthy, quick breakfast and is easy to clean up. If I’m using frozen berries, I’ll use a traditional blender to help chop up the frozen berries. Using an immersion blender or blender, mix together the yogurt, berries and slowly add in enough milk until slushy. Just make sure the yogurt is thawed and slushy with fresh berries. Agreed. Frozen Greek yogurt is the perfect replacement. 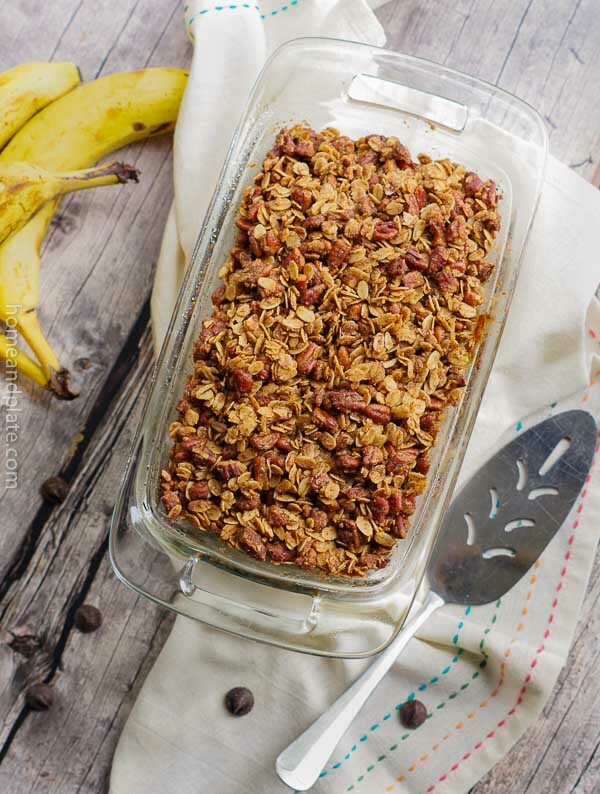 So deliciously simple, looks so good! Quick and easy! I also try to avoid bananas, and I never think to put Greek yogurt in smoothies as a protein source. I bet it beats spirulina! I would have to agree with you. Thanks Elena. Looks basically PERFECT to me! This is how I like to do breakfast!